The above is on a 300K brevet, west of Nephi with Mount Nebo in the background. Photo by Richard Stum. Do you like long rides? Really long rides? If so, then you randonneuring is for you. A randonneur (rahn doe ner) is a cyclist that rides brevets. Therefore, randonneuring is the sport of non-competitive, long distance road cycling. Randonnée is another French word, which loosely translated, means a long rambling journey. Randonneuring is different than “self-contained touring” as we travel lighter, without the heavy pannier bags needed for camping. So what does “brevet” (pronounced bruh-vay) mean anyway? It is a French word that means certificate, as in a small white card. In the cycling world, a brevet is a minimally supported, ultra-distant, road cycling event. In other words: an extremely long bike ride (typically, 125 miles or longer) with little, if any, outside support. A brevet is not a race, although riders do seek to improve their personal best times. For many, the goal is simply to finish or go farther than they have before. These events are timed and one must meet the intermediate and final cut off times to qualify (a generous 20 hours is allowed for a 300K (190 miles). 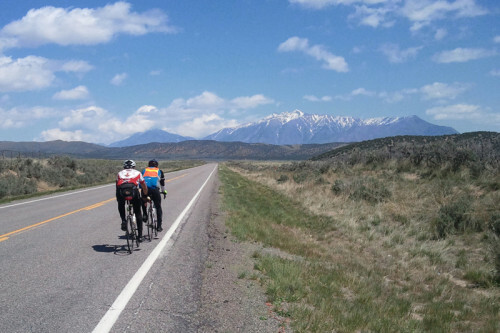 Randonneurs USA, or RUSA, has regions all over the United States providing organized brevets. The local region in Utah is called the Salt Lake Randonneurs. They offer rides throughout the state of Utah. The organization is co-sponsored by Bonneville Cycling Club in Salt Lake. Again, randonneuring, unlike bicycle racing, has minimal or no support during the event. Regular road bikes or recumbents are used and drafting is allowed. Longer brevets such as a 600K, 1000K or 1200K are multi-day events and usually have a drop bag service or an overnight stop (although some of us do ride 600K “straight through” the night without sleeping). Here in Utah, the Salt Lake Randonneurs offers all distances from 100 km (63 miles) to 1000 km (620 miles). 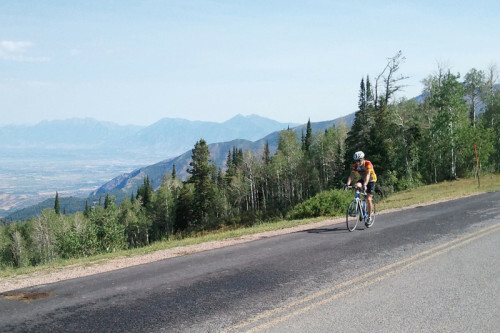 The brevets in Utah are all loop rides, or out and back. They start in various locations such as Logan, Centerville, Moab, Saratoga Springs, Nephi, Hurricane and Kanab. See the Road Touring calendar in this issue, and on cyclingutah.com for details. At the start of the ride, participants are provided with a brevet card and a cue sheet that shows the route. Riders must follow the route exactly and get to the checkpoints (also called controls) on time. Every rider must stop at each checkpoint to have his or her brevet card verified, thereby obtaining “proof of passage.” Checkpoints are also provided as brief rest and nutrition refill points. It will be very rare that you need to ride more than 35–40 miles without passing through a town or location with services, or at the very least, a potable water supply. If you should get off course, you must return to the route at the point where you got off track. It is not enough that you ride the required number of miles or kilometers — you must ride the route exactly as it appears on the cue sheet. Anyone observed taking shortcuts from the official route will be disqualified, but there is no penalty for detours or unforeseen things such as road construction, flooding, or traffic accidents. Brevets are not races, but riders must reach the checkpoints on time so as not to be disqualified. Riders can stop and rest any time, but the clock is always running. At the finish, sign your brevet card and turn it over to a brevet official, along with your receipts. The results are sent to the national USA organization and to the international governing body in France (Auxax Club Parisien, ACP). Results are then posted online. Since brevets are not races, the results are listed alphabetically and not by finish times. Finishers may buy medals if they finish a series successfully. Weather Rides are held rain or shine so bring adequate clothing for variable weather conditions. Brevets are long events and the weather might change a great deal before you reach the finish. Lighting Most brevets 300 km or longer will probably have some riding in the dark. Proper lighting is essential and required by law. See our rules page for more details. Self Reliance and Determination Brevet riders are expected to be self-sufficient and tenacious. They should be able to repair their bike, read a cue sheet, and deal with bad weather. Having said that, The Salt Lake Randonneurs are not going to leave you stranded. They do not have the resources to provide sag but can sometimes can get you back to your car or help you call a friend for a ride. Integrity It is not practical to have event officials everywhere. Brevet riders are on their honor to follow the rules. Friendly camaraderie, not competition, is the hallmark of randonneuring. Sanctioning All brevets are sanctioned by Randonneurs USA (RUSA) and most are also sanctioned by Audax Club Parisien (ACP) in France too. Certified brevets can be used as qualifiers for 1200 kilometer events. ACP brevets count towards Super-Randonneur, Randonneur 5000 & RUSA awards. RUSA (USA domestic events) count toward RUSA distance awards, R-12 & Ultra-Randonneur (200k+ events). A commercial ride has water & nutrition stops every 20-30 miles. Many brevets have no regular support—instead you must stop at convenience stores & purchase your own supplies. These opportunities are usually spaced 40-45 miles apart. A commercial ride usually has a sag vehicle. Some brevets have no support, and thus it is suggested that you have a family member or friend on call to come get you in the event of a mechanical problem or if you bonk. A commercial ride frequently has hundreds of cyclists to draft with. Many randonneurs use aerobars as they know they may be “on their own” for long periods of time. A commercial ride has arrows painted on the road, or signs posted where to turn, supplemented by a cue sheet. On a brevet, you are only provided a cue sheet, supplemented by a link to an online map or a GPS guidance system. Many commercial rides are over by dark. Some brevets run all night long, so one must pack lighting gear and night-time apparel for the cold. A commercial race has a wheel van following your age-group with spare wheels. Many randonneurs use high-spoke count rims to lessen the probability of a having a broken wheel when they are 40 miles from nowhere. On some races in a commercial ride, if the weather really turns nasty (blowing wind & hail, lightening etc. ), you can seek refuge inside the support vehicle. On a brevet, you seek refuge in a ditch on the side of the road (true story), or, if you are lucky, a convenience store, unless it is in the middle of the night and they are closed. Pro racers not only have a wheel van, but a support vehicle with complete bikes, extra clothing and nutrition. Randonneurs carry their rain gear and special foods and powdered drinks with them. So why ride a brevet? Many brevet series are offered in ultra-endurance distances not offered by most commercial rides (200-750 miles in length). The Salt Lake Randonneurs welcome anyone — for just one ride or the whole series. You do not need to be a member of any club to ride, although you are encouraged to join the club’s co-sponsoring local organization, the Bonneville Cycling Club. For most events in 2015, the fee is only $5 per ride.